MISSION: To expand, restore and protect wetlands in Southern California’s coastal watersheds. 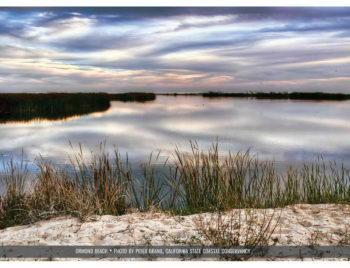 VISION: Restored and protected wetlands and rivers along the Southern California coast benefitting wildlife and people. The Southern California Wetlands Recovery Project (WRP) consists of directors and staff of 18 public agencies coordinating with each other regarding the protection, restoration, and enhancement of California’s coastal wetlands and watersheds between Point Conception and the Mexican border. 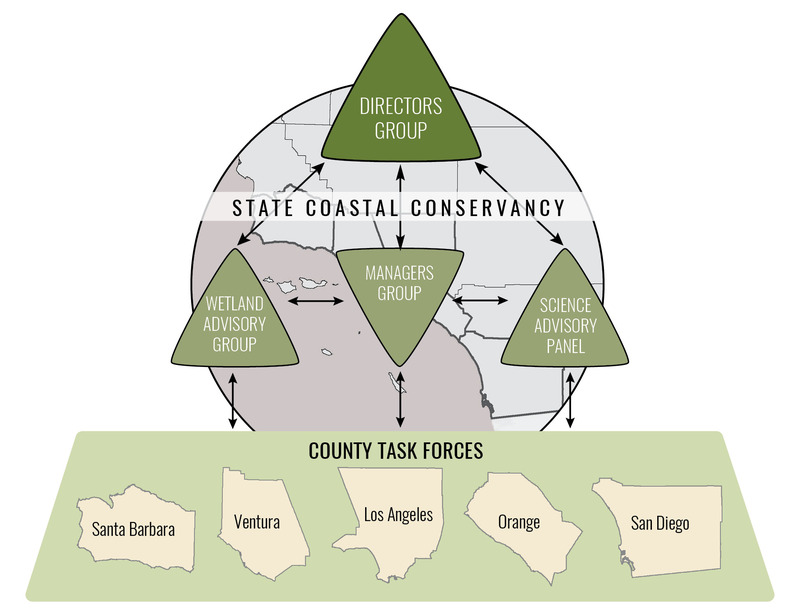 The WRP is chaired by the California Resources Agency and supported by the California State Coastal Conservancy. Through the WRP partnership, public agencies, scientists, and local communities work cooperatively to acquire and restore wetlands in coastal Southern California. The WRP provides a structure that allows agencies to discuss project design and approach, and coordinate funding opportunities, for the most efficient and effective expenditure of resources. By cultivating resilient wetlands on a landscape scale, the WRP aims to enhance the economic, environmental and recreational benefits of wetlands in Southern California. The Southern California Wetlands Recovery Project (WRP) was created in 1997 as a regional voice for the valuable yet diminishing coastal resources of Southern California. Prior to the creation of the WRP, there was little regional coordination or communication between public agencies, non-profit organizations, and community members who had a vested interest in Southern California’s wetlands. Many people held little hope for the parceled wetlands that remained in the rapidly developing region of Southern California. Since the formation of the WRP, the future of Southern California’s wetland resources has been much brighter. 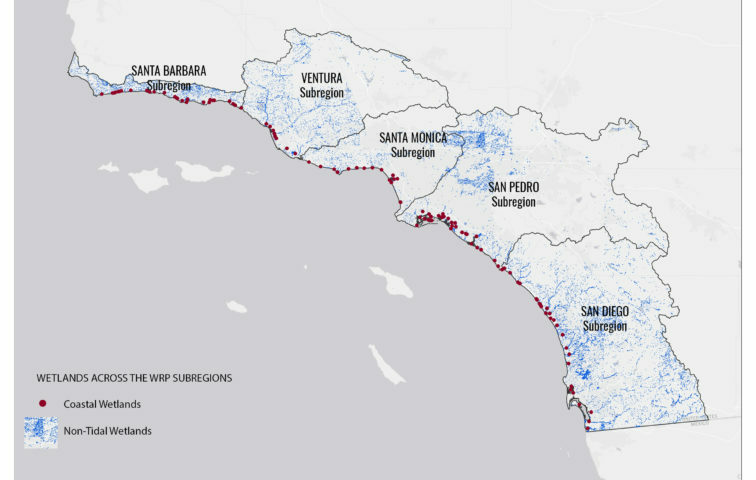 The WRP’s geographic scope is from Point Conception in Santa Barbara County to the international border with Mexico, including California’s Channel Islands (see map below). The physical features, climate, and hydrology of coastal Southern California have produced an unusual set of conditions and a diversity of plants and animals that sharply distinguish the region from any other in North America. Unlike the broad, gradually sloping coastal plains of the Atlantic and Gulf Coasts, Southern California has steep, coastal mountains that descend sharply to the ocean. Summers are hot and dry in this semi-arid, Mediterranean climate, while winters are cool with rainfall varying in amount and intensity, from droughts to steady rains to torrential downpours. For instance, the San Gabriel and San Bernardino Mountains can experience more rain in a twelve-hour period than anywhere else in the continental United States. Representatives from each of the WRP partner agencies form the WRP Directors Group. The Wetlands Managers Group, made up of staff from each of the partner agencies and representatives of other key stakeholder organizations, along with the Science Advisory Panel, conduct the oversight and implementation of WRP projects and research. The Wetland Advisory Group provides local input from on-the-ground land managers and restoration practitioners. While the Wetland Advisory Group serves to represent key WRP stakeholders, the County Task Forces provide additional stakeholders and practitioners who are called upon on an as-needed basis to help identify on-the-ground issues, promote wetlands education, and implement projects. The Working Agreement, signed on September 8, 1997 and on amended December 11, 2017, explains the structure of the WRP collaboration.